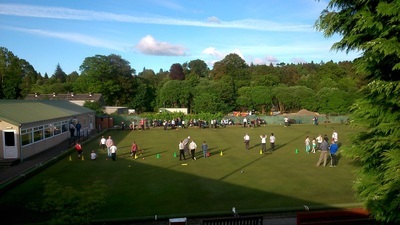 Dunblane Bowling Club are hosting a fun day on 18th July from 11am - 5pm. If you are in the local area or passing by it is a great opportunity to get the family together and give bowls a try! It is also absultely FREE! The next Dunblane Cluster meeting will be taking place on Monday 22nd June at Dunblane Sports Club starting at 6.30pm. This meeting is a great opportunity to share good practice and receive updates on access to funding, coach education and plan each clubs school-club links for 2015-16 in order to increase participation numbers! Dunblane Soccer Club coaches recently went through a coaches workshop to continue to support their members further with positive messages to impact players and teams. 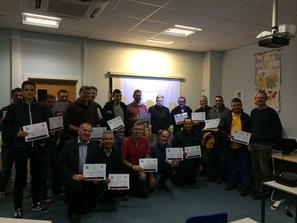 Scott Kinross, Scottish FA Football Development said “Dunblane Soccer Club were very engaging in helping set up this workshop and the volunteers on the night were very enthusiastic taking on board the key messages that Positive Coaching Scotland provides. The club are currently at “Standard Level” of Quality Mark and the aim is during 2015 to assist them in reaching “Community Level”. David Dale, Chairman, Dunblane Soccer Club" With 21 coaches attending the PCS workshop, it showed a fantastic commitment to the ethos of positive coaching within our club. 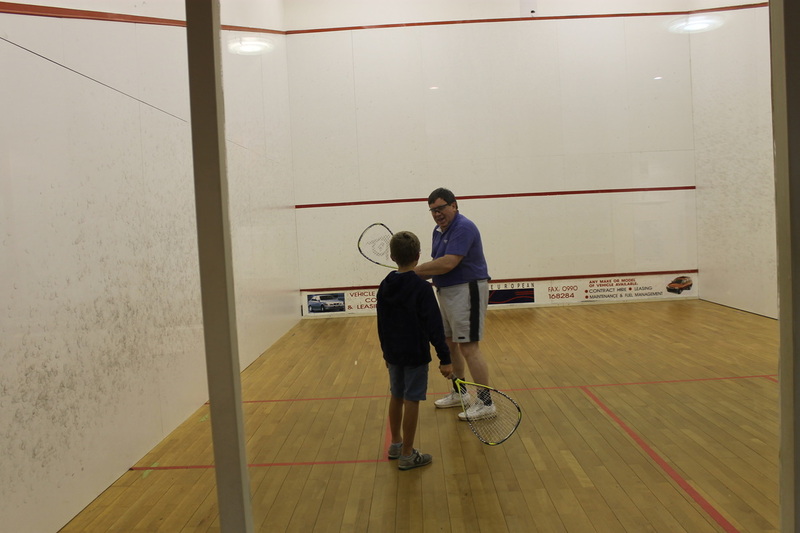 Our aim is to create a learning environment where kids want to come and play. Every session should be enjoyable, fun and challenging ensuring they want to come back for the next session. The PCS workshop was great chance for everyone to come together to discuss how to move forward as a club with great facilitation and support from Scott Kinross. The positive messages delivered by Scott were very much aligned with the positive culture we are trying to create"
Dunblane Fencing Club are offering a fantastic come and try beginners fencing course during the school holidays from Monday 11th to Thursday 14th August. 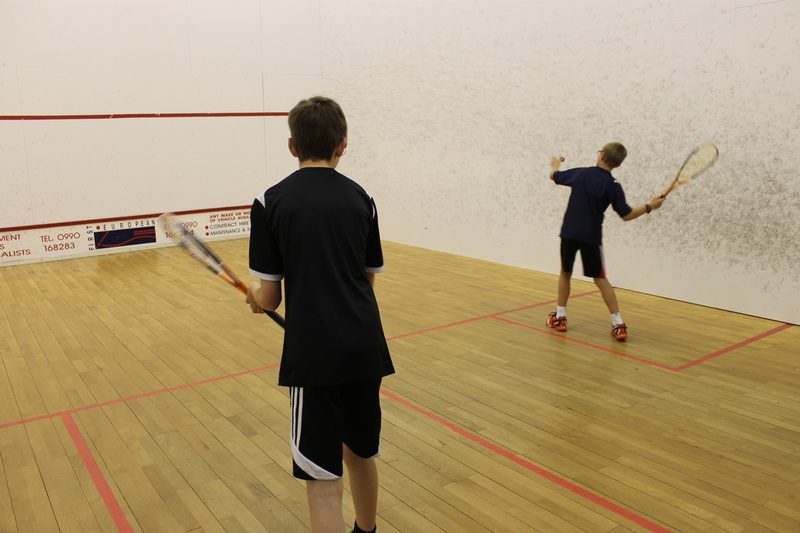 The course will be aimed at children aged between 8-12 and be two hour sessions aimed at providing the children with the basic moves and skills in the sport. 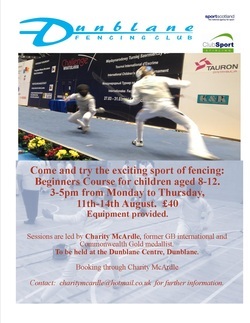 The cost is £40 and the sessions are led by former GB international and Commonwealth Gold Medallist Charity McArdle who is also the club coach at Dunblane Fencing Club. 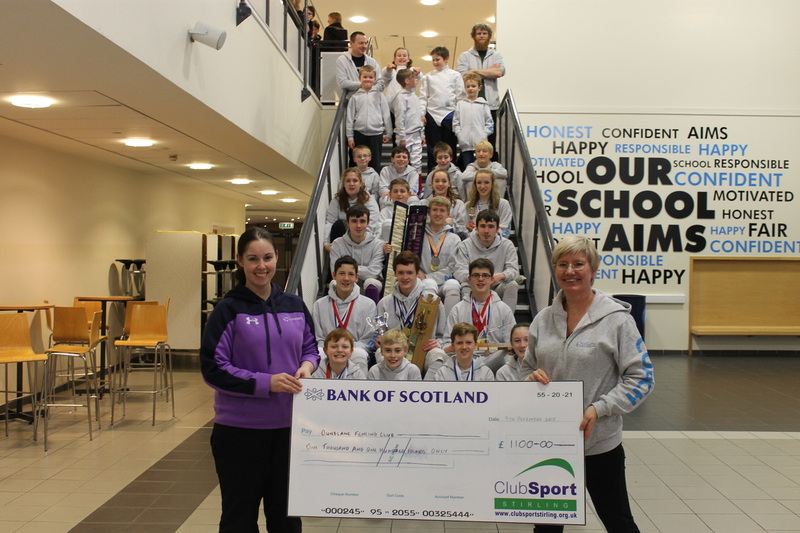 The Scottish Secondary Schools Team Fencing Championships took place at Dunblane High School over the weekend of 16/17 March. 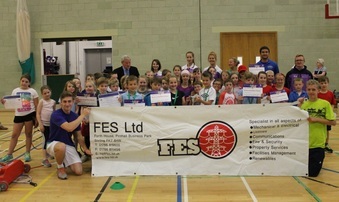 Over 200 young fencers battled it out in 3 weapon categories- Foil, Sabre and Epee, against schools from Dundee to Dunoon. Dunblane High School had an extremely successful competition fielding 8 teams across both Under15 and Over15 age groups. 3 very hard fought bouts, the Over15 team emerged bronze medallists. Our under15 team won gold to become Scottish Schools Team Champions, a remarkable achievement since they only began training with the Epee four weeks previously. The Sabre competition took place on Saturday afternoon where the boys’ over15 team missed out on a medal place by only 3 points but the captain, Robin Lee, was awarded most technically stylish fencer for Sabre. Sunday saw success for Dunblane girls competing in the over15 Foil category. The team, Megan Gouw, Wendy Exton, Caitlin Gean and Khemindi Gunasinghe, emerged as silver medallists showing considerable resolve and resilience against much more experienced fencers. 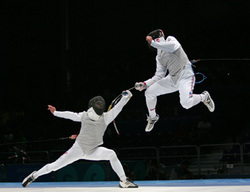 The boys were also competing in under15 and over 15 Foil and, in tough group and knockout stages, consistently drew on reserves of tenacity to grasp success in what was a very closely fought category. One boys’ over15 team, Robin Lee, Connor Jaffrey, Rory McNichol and Wallace Jaffray (R) took silver medal whilst Wallace Jaffrey, Liam Edwards, Scott Cocker and William Parkinson secured 4th place. In the under 15’s, the team of Louis Bryson, Alex Papadopoulous, Leo McArdle and Tom Brown narrowly lost out in the final to gain silver. The other under15 team, Craig Mason, Robbie Ransom and Neil Brown although not getting to the final stages, were the only team to beat the Dunblane silver medal team in the group stages. The excellent performances across the board would not have been possible without the dedication of head coach Charity McArdle and her team. 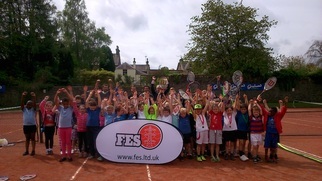 "All our young people who took part showed great sportsmanship to other competitors and were an incredible support and encouragement to each other – a credit to their club and Dunblane High School."